That would be easier without her mother, freshly released from an asylum, acting overly protective and suspicious. And it would be much simpler if the mysterious Morpheus didn’t show up for school one day to tempt her with another dangerous quest in the dark, challenging Wonderland, where she partly belongs. It's been only twelve months since Alyssa has returned from Wonderland, her mother has been released from the institution and Jeb and Alyssa are happy and in love. Pity he doesn't remember his time in Wonderland, after following his muse with the promise of keeping her safe. But lately Jeb has been throwing himself into promoting his dark fairy artwork inspired by Alyssa, and determined to make something of his life. But as Jeb begins to pull away, Alyssa' s ties to Wonderland are calling her home and Morpheus is adamant that she now needs to claim her rightful place as queen before it's too late. But Alyssa can't leave with her relationship with Jeb hanging by a thread. Throwing herself into her new mosaics, the morbid artwork created with blood and gems tell the story of a Wonderland future, a future Jeb knows nothing about. Deciding to confront her greatest fear, Alyssa needs to tell Jeb who she is, and the time they shared in Wonderland before she returns, but it may be too late, as Morpheus enters the mortal world. Taking on the body of a British exchange student, Morpheus is all anyone can talk of at Pleasance High. With a band of swooning females in his wake, Morpheus is determined to show Alyssa that in order to become Queen and keep her loved ones safe, she must leave Jeb behind, his naivety being a weakness that Alyssa simply cannot allow. But Alyssa's indecision to act brings the inevitable, Wonderland has come to her world. 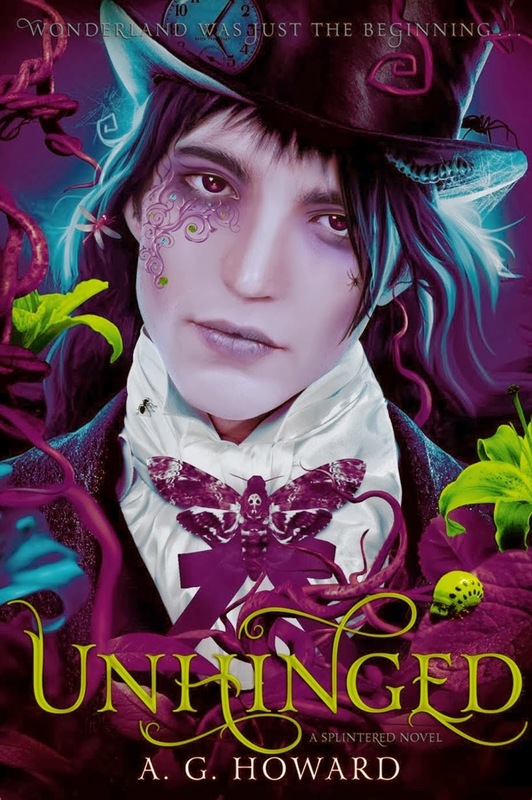 It goes without saying that the Splintered series has the most stunning covers readers are likely to find, but I would expect nothing less from a series so utterly brilliant. Unhinged begins with Alyssa's life carefully being repaired. Her mother is home, Jeb is an incredibly devoted boyfriend and in a matter of days, Alyssa will graduate. But when you're a descendant of Alice from the original children's tale told by Lewis Carroll, you can expect life to throw a few surprises your way. Author A. G Howard is an incredible storyteller with an amazing imagination. Creating not only an epic fantasy series, but beautifully written and a world in which readers can immerse themselves. Where Alyssa was previously unwavering in her loyalty towards Jeb, in Unhinged we see her darker side wanting to break free and her attraction towards Morpheus becoming too strong to deny. I'm team Morpheus all the way, he's eccentric, charismatic and Jeb is barely noticeable in his shadow. I really don't understand Jeb's character at all, besides being the anchor and love interest in Alyssa's human world. He reminds me of Adam from Tahereh Mafi's Shatter Me series. He's there as an option, but surely his lackluster and self centered personality is no match for the great and powerful Morpheus. I'm not generally a fan of fantasy novels, but this series is incredible. You don't need to be mad to enjoy Unhinged, but it sure helps. I wasn't sure if I like this series or not, but holy crap, it's just incredible isn't it. It's Morpheus, his character makes everything better. I couldn't agree more, the Moth is incredibly awesome. You do realise we're both fangirling over a magical insect, people have been committed for less than that. I love AG Howard's writing as well as the stuff she thinks up! I've put this one off so far, sadly, since the first few chapters didn't hook me right away, but I might pick it up again soon. I see the resemblance between Jeb and Adam as well. I'll admit that I love Adam! I don't really have a side in terms of the romance in Splintered, but I honestly prefer Jeb over Morph (don't kill me!) --which seems to be an unpopular opinion, haha! Anyway, glad you really enjoyed this one, Kelly! She's just incredible isn't she. I can understand the lure of Jeb, he's definitely the underdog in the series. I think it's a case of the responsible and stable Jeb, verses the flamboyant and free spirited Morpheus. Pity both characters can't be rolled into one. Maybe book three will be that Morpheus is really Jeb's alter ego. Then everyone goes home happy. Thanks for stopping by Aimee. I've heard a lot of similar opinions about Jeb and Morpheus, and I like the sound of how the main character evolves. I'll pick this up soon when I feel like it! Lovely review. It's deliciously dark and one of the few fairytale retellings that I've completely fallen in love with. I'm super fussy with my fantasy novels, but this one is awesome Jeann, you won't be sorry.